Faster is better. Or is it? 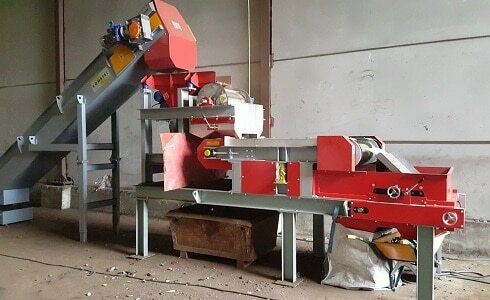 The magnetic rotor on an Eddy Current Separator produces the all-important separation force to recover or remove non-ferrous metals such as aluminium. The multi-pole magnetic rotor rotates at high speeds (2000-4000 RPM) and we assess whether higher speeds produce a better separation. The separation principle of an Eddy Current Separator is based on Fleming’s Left Hand Rule. When a non-ferrous metal is placed in the rotating and changing magnetic polarity of a magnetic rotor, a current is generated inside the particle. This current produces it’s own magnetic field, which then reacts against the magnetic field of the rotating rotor. This causes the non-ferrous metal particle to repel. This repulsion enables a separation. In operation, the repulsive action causes the non-ferrous metal particle to spin and lift. The Magnetic Rotor of an Eddy Current Separator is positioned inside a non-metallic shell at the head of a two-pulley belt conveyor. Material is conveyed on the belt into the magnetic field. As the non-ferrous metal enters the rotating magnetic field, it reacts and is propelled away from the belt. A strategically placed splitter enables the segregation and collection of the non-ferrous metals away from the non-metallic materials. With regards to the Rotor Speed, there has been a misconception that higher speeds produce better levels of separation. Separation is due, in part, to the rate of change of magnetic flux. This is a function of the rotor speed, diameter and the number of magnetic poles. However, with regards to rotor speed, it is a preferable design criteria to keep this as low as possible. In fact, controlled tests have shown that there is an optimum rotor speed for every design of Eddy Current Separator. This clearly identifies that excessive speeds have no separation benefit. Tests confirmed that there is a point for every magnetic rotor where there is no separation benefit from additional rotation speed. For the Master Magnets concentric design of Eddy Current Separator, the distance a non-ferrous metal particle is thrown shows a negligible gain once the Magnetic Rotor reaches 3000 RPM. Further tests, on different sizes non-ferrous metal particles, showed that the distance thrown may be further or shorter as a function of the size. However, once 3000 rpm was reached and exceeded, there was very little additional throw. 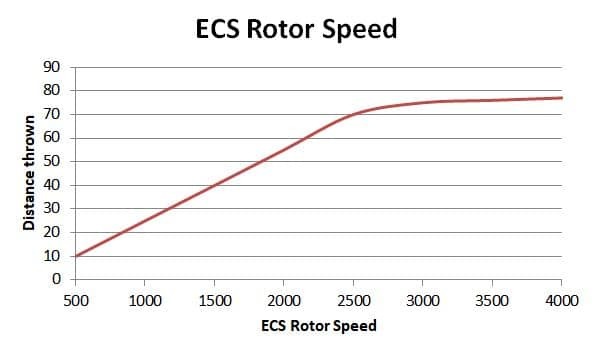 For this reason, it is not possible to adjust the rotor speed of many Eddy Current Separators. The optimum rotor speed is set during final testing. Further commissioning on site focuses on the other variables such as the belt speed, splitter position and burden depth of material. In this series of technical blogs, we will examine a wide range of operational parameters of the Eddy Current Separator. This information has been obtained through extensive testwork at our manufacturing and test facility in the UK and on site. Ferrite or Rare Earth Overband Magnet?